Welcome, one and all, to the final chapter of Infusions of Grandeur. It's been three years since we last posted, and it's clear that we're never going to get this thing back into gear. Too much has changed. For one thing, the Mad Scienticians hardly ever drink liquor anymore, so the purpose is essentially moot. For those of you joining us for the first time, please peruse our archives; we have detailed information about many vodka infusions that we have created, and the drinks we have made with them. It is our hope that our readers who are interested in trying this at home will learn equally from our successes and our horrible, horrible failures. Our story tonight begins in a long-ago era known as 2009. Infusions of Grandeur had laid dormant for a number of months. Our laboratory was in shambles. Our spirits were broken. We had made a terrible miscalculation in our time travel experiments, looping the ends of a cosmic string, in an attempt to return to our former glory. The results were disastrous. It was time to vacate our lab, and preferably enter the Witness Protection Program. In our haste to move out, we boxed everything up and put it all into storage, with the intention of sorting it all out later. We started to. And then our new lives began to whittle away our time, and some of those boxes haven't budged since. We thought we had unpacked and re-hid all of the evidence infusions, but it we missed one box. Fast forward to last week. I was embarking on my first solo project of my newest endeavor: beer brewing. I was missing one piece of equipment, however, so I delved into the dank recesses of our storage facility to find it. I didn't find what I needed, but I found a few things of interest. One was a box of books that I had thought gone for good, some of which I'd already bought new copies of. The other was our wayward package from the laboratory. The package had six items in it. One of them I will get to in a moment. Another was an empty bottle. Three of them were half-empty bottles of store-bought liquor. And the last one was this. 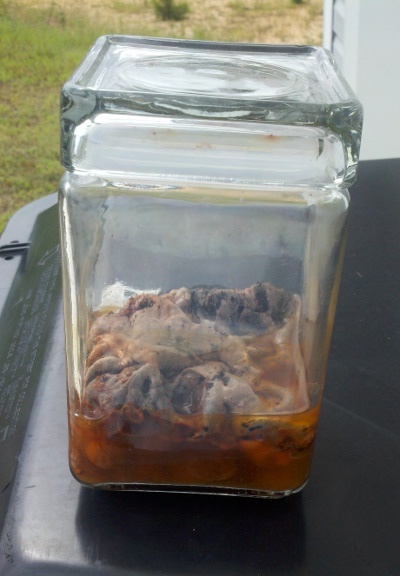 At first, I had no idea what horror this science jar contained. I was fairly certain that I had found Hitler's brain. After discussing it with Wayland, he reminded me that we had stopped using this type of jar in the early days of IOG, when we realized that they aren't airtight, and began using canning jars instead. The only time we had used the old (and larger) jar was for one experiment that wouldn't fit in Science Jar 2.0. The first time we wrote up this experiment, our mixture of bourbon, muddled cherries and brown sugar had been infusing for just shy of three weeks. We decided it wasn't ready yet and wanted to give it more time. We were thinking a few more weeks, maybe a month. But we put it in the back of the science closet and forgot about it. When I found these partly-evaporated remains, the experiment had been running for three years, three months, and five days, most of that without the benefit of climate control. The final item in the box was not nearly as nausea-inducing, but it was horrifying in its own way. In the days when we drank more, our infusions were handy to have around, and the most successful experiments were repeated over and over as supplies dwindled. One of our favorites was vanilla vodka. This infusion is made by splitting a vanilla bean down the middle, and infusing it for three to five days. Our lab records don't reveal a start date for this batch, but it's been infusing for at least two and a half years. We suspected that we had successfully created a fifth of vanilla extract. Vanilla vodka was an easy one to overinfuse, resulting in too strong a flavor. This much time could only exacerbate the effect. Though we were fearful of burning out our taste buds once and for all, we knew we had no choice but to once again don our lab coats, sample the vodka and report on our results. Wayland chilled two shots in a shaker of ice and poured. We toasted to the past, and then it was time to drink. Both of us were hesitant to be the first to try it, but Wayland volunteered in the name of science. He contemplated his fate for a brief moment, then tipped the shot back and swallowed it. The results were surprising. "The first thing I noticed was overall how smooth it was," he wrote. "There was none of the alcohol burn I expected. It was most definitely a strong vanilla flavor. A bit stronger vanilla than I think I would have preferred, but honestly, it would have been sippable straight up, if not for the stale flavor that lingered on the back end." Despite Wayland's positive reaction, I was still apprehensive as my turn arrived. Regardless, I fulfilled my sacred duty to the scientific process. My experience wasn't quite as favorable as Wayland's, but it was nowhere near as bad as I had expected. The flavor was strong, to be sure, but it was not really that harsh. Unlike Wayland, I did feel a bit of an alcohol burn. I was surprised that the flavor was not stronger than it was; it seems that the flavor plateaued at some point, or reached terminal concentration, once the vodka and bean reached some sort of equilibrium. Our fears that we had created vanilla extract turned out to be unfounded. We did some research after the fact on what this would involve in a literal sense. According to Wikipedia, "pure" vanilla extract contains a minimum of 35% alcohol (we have that one covered) and 13.35 ounces of vanilla bean per gallon, per US FDA regulations. Further research revealed that one ounce of vanilla is about seven beans. A few quick calculations later, and we determined that we would have to infuse 18.5 vanilla beans in a fifth of vodka to make 750mL of vanilla extract. Ours was a mere 5.4% of pure strength, regardless of the time interval. 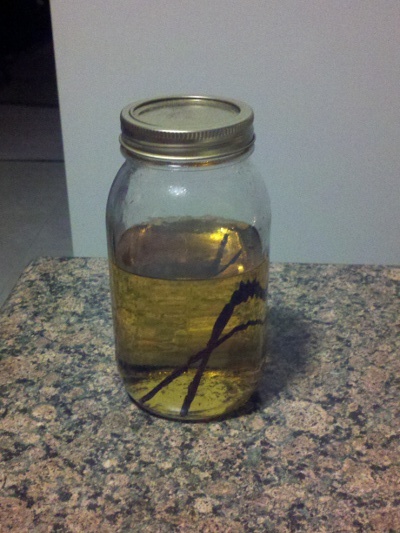 So if you are interested in making your own vanilla extract, now you know how it's done. We declined to take a shot of actual vanilla extract for control purposes. The day after we sampled the vodka, we had a small get-together at the laboratory, and our friends Lexie and Shyla enjoyed several drinks containing the super-infused vanilla vodka. So even at this high flavor strength, it is quite drinkable, especially when diluted with other ingredients. We can only declare this accidental experiment to be a success. So, this concludes the final experiment of Infusions of Grandeur. We realize that when we dropped off the face of the earth, we left several ongoing experiments without conclusions. Most of our lab records from that era are long gone, but we will answer any questions posted in the comments to the best of our ability and memory. Until then, this is the Mad Scienticians, signing off. Oh My God It Burns!